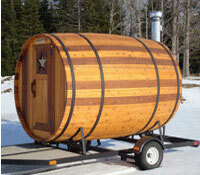 The portable, one-of-a-kind, Barrel Sauna is uniquely styled. Its design is very energy efficient. Unlike most conventional saunas with squared corners, the Barrel Sauna's cylindrical shape allows greater air exchange from top to bottom giving the sauna a great advantage over traditional square designs. The cylindrical design has 23% less cubic feet of area to heat up than standard wall-and-ceiling style saunas. 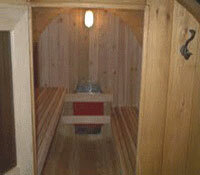 This allows the sauna to heat up sooner, which in return lowers the costs of operating the sauna. The wooden floor is another advantage of the Barrel Sauna. It is much easier to heat, allowing the lower areas to more easily maintain ideal operating temperatures. Compared to saunas built with a concrete floor, the Barrel Sauna distributes the heat and moisture more evenly throughout the sauna. 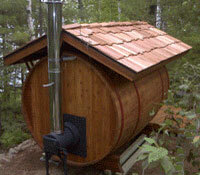 The bowed shape of the Barrel Sauna allows all the water in the sauna to flow naturally towards the center of the floor. Optionally installing a drain at this natural low point makes it easy to drain any excess water from the sauna into a collection system (bucket, septic system or sewer). This also allows for a shower or fresh water supply to be installed inside the sauna to make bathing, filling the water bucket, or cleaning the sauna easier. At Sisu Saunas we skillfully handcraft our Barrel Saunas using 100% red cedar, we use skills and tools very traditional to the Finnish heritage and to the art of barrel making (cooperage). The result is a classic and elegant aesthetically pleasing barrel-shaped sauna that offers years of enjoyment, a lifetime of health benefits and provides ultimate relaxation. 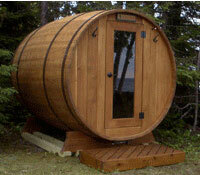 Our Original 8' Barrel Sauna is 7' 11" long, 6' 4" wide and 6' 8" high. This sauna weighs approximately 700 - 800 pounds and is suitable for up to 8 people. 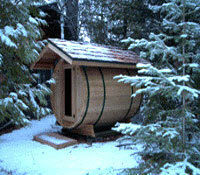 The Original 8' Barrel Sauna also offers the option of upgrading to our wood burning stove package. 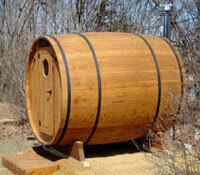 The Mini 5' Barrel Sauna is 5' 3" long, 6' 4" wide and 6' 8" high. This sauna weighs approximately 600 - 800 pounds and is suitable for up to 4 people. Please note due to its size the option of our wood burning stove package is not available for this model. 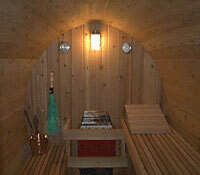 A Standard Barrel Sauna Package starts under 4800 dollars, arrives fully assembled and ready to "Take the Heat". All packages include the stove & rocks, a vapor proof interior light, thermometer, hygrometer, copper bucket & ladle, back brush, vihta, an exterior "sauna" sign and exterior towel hooks. All the needed accessories to operate and test drive the sauna as soon as it arrives. Also to personalize your Barrel Sauna you choose the band color, door style, door swing direction and bench height layout at no additional cost. Optional upgrades for a larger watt electric stove, or the wood burning stove package (8' Original only), along with a roof awning, entry platform, exterior finish, interior sealing, a floor drain and optional base kits are all available. 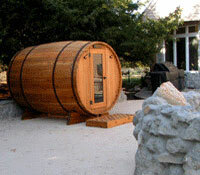 The Barrel Sauna offers an attractive, fun, portable, and inexpensive alternative to building either a stand-a-lone outdoor sauna building or a built-in interior sauna. 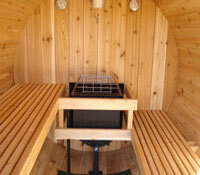 Barrel Saunas are also very versatile and can be placed either indoors or outdoors. Be sure to check with your local planning and zoning department and the local health department for any required permits.